If I were to describe the 2013 version of the Nifty Ten Fifty in one word, I would choose... FAST! The Four Hour moving time barrier was shattered, even with the fastest riders taking a slightly longer detour. I established a new, "Elite" P 1,2 group this year, and it was well attended, and those guys really beat each other up good. Amazing speeds on the climbs all day. I will let Elite guide Josh Dapice describe his group (see below). The "A" group was also the most competent and fast we've ever had, and many were able to latch on to, and hang with, the Elite Group. The "B" group was also super competent and fast, led by Gaston McMillan. Bill Dunn led a very small "Nifty Lite" group. My "A" group was about 15-20 riders strong, and the pace was pretty hot from the gun. I dangled at the back, pushing a bit at the top of each climb to catch up, so that I could lead the tricky descents. Everyone rode well, very safe, yet fast. I was especially thrilled to have my Marc Pro - Strava teammates along, Christopher HD, Glenn Rawlinson, Kevin Susco, Kevin Keenan, and George Smith. I have some preliminary results below for three segments of the ride. Marin KOM demonstrates a rider's maximum climbing ability while fresh, on a short, steep climb. Claremont/Grizzly/Vollmer shows a rider's ability on a longer climb late in the ride while fatigued. And the overall moving time demonstrates the rider's speed over the entire course. Some data is missing. Some Elite riders took a slightly longer detour, and hence the times are not perfectly accurate. But since they took a "long cut" vs. a "short cut" it isn't necessary to DQ them as I had threatened. Gaston's B group report is below the results. If you know where you placed on the Marin climb vs. your peers, but did not upload to Strava, let me know and I will insert you in the results. Special thanks and kudos: To Gaston, Josh, and Bill, for leading their groups. To Clif Bar for bars, gels and blocks at the rest stop and Gu, for some Roctane products at the start. To Clark Foy for helping out with the course. Great cameo appearance from Chris "Big Ring" Randall. Also nice to see Ted Huang show up and ride. Kudos to my teammates for representing Marc Pro - Strava in fine form. Special Kudos to Christopher Harland Dunaway for showing up the day after winning the CCX P 1,2 race and still having legs to put the hurt on the Elite group. Bill Bushnell showed up on his hybrid electric bike, and did a great job on the course. First thing in the morning, I saw blue skies to the East, and I thought that we'd have some killer views later in the day. But some rather brisk Westerly winds blew in the marine fog, and dampened the views. On the bright side, temps were cool and comfortable for climbing hard, and we had a nice tailwind going up Claremont partially compensating for the rubberized legs, and making times slightly more respectable. It was overall a great day and a very successful event. My only regret is that we didn't have more women participating in the ride. With 70 or so riders, we only had one woman, Alison Chaiken. I hope to see more women participating next year. Results for overall moving time are approximate and only show those who uploaded to STRAVA. Those who circled at the top of climbs, or went backwards to help another rider will have slower times. Elite group, and some "A" riders took a slightly longer course, probably adding 5+ minutes to their time. I should have known that something was up when our “9:30” group was all assembled and ready to go at 9:15. Looking forward to a brisk morning with a few climbs through the east bay hills I figured there was no harm in getting started. We had a small but top notch group consisting of Bill L, Carl N, Chris HD, Clark F, Daryl S, Rob M and Tom R. We immediately headed off up Moeser lane at a pace that had my Garmin spitting out some remarkable watts. Pretty interesting for a day that promised 10,000 feet of climbing! • Clark setting a diabolical “welcome to the NTF” pace on Moeser. Definitely set the tone for the day. • Bill, Carl and Chris taking off from the very bottom of Marin. Bill and Chris posting incredible times even after taking a few breaks at Hilldale and Keeler. • The awesome rest stop set up by Paul near the Brazil room. Great spot to recover a bit and grab some Clif Shots and pretzels. • South Park – Bill going berserk at the bottom and sticking it all the way to the top via his endless surges. • Sharp eyes spotting Mr. Strava himself Michael Horvath on Grizzly Peak Blvd. coming the other way. • Snake Rd – beautiful climb that inspired some race-style attacks. Even towards the end of the ride guys were making huge efforts (joined by Ted H. from the earlier group). • Daryl committing at the bottom of Hiller, almost the end of the ride and one of the steepest parts of the day. I have no idea where he found the energy. • Chris trying to work out how to get home from Domingo Peets, unaware that we had one, final 1,500 foot climb to the top of Vollmer yet to go. Chris ended up crushing the rest of us on the climb regardless. This has to be one of the best ways to post good Strava times. It obviously wasn’t a race, which lent itself to extremely aggressive climbing. 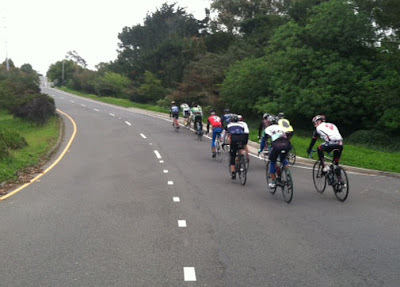 The East Bay has many superlative riders who ride these climbs regularly year round (OK maybe not Marin or Hiller) so it was pretty impressive to see where our group stacked up. I’ll be eager to see what folks can do next year. I wanted to thank the guys I rode with for (a) being in such a good mood all day, (b) riding safely, and (c) tolerating a few routing mishaps. Thanks Paul for a great day. 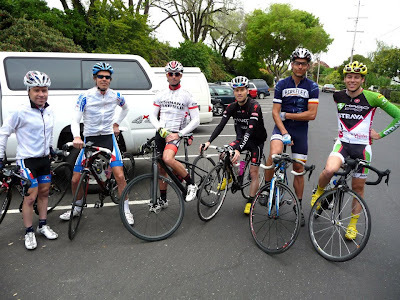 Click on names below to see their Strava file. There is something beautiful and elegant riding with a group of new friends; streaming downhill in a serpentine line making our way to the next climb and seeing the riders ascend to the top of the ridge. And on a day like today, through the course of the Nifty Ten Fifty it happens again, and again, and again. As the guide, or 'B' group leader, I lead most of the descents through the twisting turning course and would glide back as the stronger guys in the group make there way to the top where they could have a rest. In truth, the 'B' group was great, many or most, like myself, were taking on the challenge of this ride for the first time, and there is nothing like a new shared experience to bring people together. And we stuck together really well through the day. I think there were about 35 people at the start, and we were about that size coming into the last climb. Moser and Terrace kicked us off, not really a warm up, not quite a suffer-up; we made it to the parking lot of the school as a nice big, perhaps overly optimistic group. Of course, Marin tried to crush that optimism, to no avail. We took off for El Toyonal in good spirits. it's true that after Marin, El Toy doesn't seam that hard, even though we know it is. I think we also expected to see the Elite and 'A' group about the time we were reaching the top by the steam trains, even taking a moment to water up. We were doing well, keeping them at bay - for the moment. From there I missed a left turn, which we went back to make as a right, and then made our way through the Alma mater of some of the riders before heading up Centennial. Someone said they thought it was longer, I felt it was long enough. After heading down to Wildcat we made short work of Canon before the rest stop. At the rest stop, everyone converged and we lingered. Everybody was happy to get some food and drink as well as catching up with each other for a few minutes. The feeling was charged, palpable. We'd made it through the half way point and everyone was doing well and feeling good. The 2nd half takes us to some of the great neighborhood climbs of Oakland, after Southpark to bring us up where we make the longest ride between climbs for the day. We all were looking forward to Snake and Broadway Terrace as they weren't out to strike us down like Marin or the upcoming Hillier. It was on these two climbs that the strong men of 'B' group made their way off the front pacing their way to the top. It was on Snake that we got, for a very brief instance, to glimpse the climbing acumen of the Elite and 'A' group. They passed me so fast I started to put a foot down and step off my bike. After these two climbs we headed to Hillier, a tough 'ol climb that kicks off the ramps through Claremont Hills. The 'B's stuck together really well through here, it's a twisty trail of turn and climbs that eventually lead down to Tunnel and then to Peet's for a cup of coffee. Except when we got there the idea of stopping just didn't sit well with most of the group and we headed directly to Claremont and Vollmer Peak. I'd like to say I was in roughly the middle, finishing in 5:17, with about an hour of stopping added to that. And it was a great group to be in the midst of; everyone enjoying themselves, keeping us all together, watching out for each other, riding at a steady yet challenging pace, and being safe. I wish I could remember everybody's name; some I'll find on Strava, some I'll recognize when I see them on the road, all of them having shared the experience of an amazingly fun and sometimes difficult day riding in the Eastbay Hills. I can't express my appreciate enough; to the 'B' group and everyone who showed up for a great ride among friends, and especially to Paul McKenzie. Thank you, everybody, very much. The Nifty Lite (aka The Thrifty Nifty) is offered both as an intro to the Full Nifty and as the lessor of all evils. The route typically avoids Moeser, Marin, and Hillier as well as the southern neighborhood climbs ad then ad libs some extra climbs, generally garnering between 6,500 to 8,000 feet of gain. This edition ran with 3 or 4 coincidences and one, maybe two glitches. For the last few years the thrifty group has been composed of Paul's wife Janet, myself, Brian Crowley(who stopped by to say Hi at the start) and Becca Heald, a local friend of Janet's who joins us for a part of the ride; basically one gal and two guys for the whole thing. (With all the hits that Paul was getting on the website we were expecting more this year.) This year it was Barry ____ , a local who can be seen in brown and white front and center in the Rest Stop photo, and Alison Chaiken from Mt. View. So two guys and a gal again.) None of us were sure about how much we could do, but we were all wanting to go just like the other groups. As leader, I did tell Alison (who was cautious descending) that we'd wait for her, but I didn't tell her that we'd wait at every actual turn, so when she saw the El Toyonal sign on Wildcat Canyon she turned off, then realized her mistake, and continued on down. By that time Barry and I decided that she must have cut over so we went ahead hoping we'd run into her, maybe find her waiting at the top of Lomas Cantadas. As luck would have it, Barry and I stayed on El Toyonal while Alison followed the prescribed route (thereby gaining a shortcut) and then ran into us as she emerged. As we continued Barry saw that he was feeling pretty good so at the rest stop he decided to go with the B group. We saw him later on the southern descent of Grizzly Peak Blvd looking like he was having a fine time fitting right in. Alison and I enjoyed the wonderful South Park climb and the climbs just off of Hillier and then made our way to Peets where Alison declared that she just couldn't take... another long descent! Truth be told we had be riding in cloud and mist up to that point and she had gotten chilled, and it made sense for her to wind her way back to the start along the flatlands. That left me to enjoy the tailwind going up Claremont Ave all by myself, where I found myself missing Janet and Brian to help egg me on to keep going. I found, however, that even though my flesh was weak, my spirit still wanted to GO. I really like the Nifty Ten Fifty because it serves as a wake up call and as an eye opener to both steep, steep climbs that you'll probably never see in such succession the rest of the year, and to the fact that even a "Lite" rider can climb through some number of them without pulling ones legs out of the hip sockets! Finally the last coincidence came at the afterglow pizza party attended by Bill Bushnell, Gaston, Paul and I: Bill Oldham usually leads the B group and even though he couldn't make it this year, we still had two Bills at the party! Thanks Paul and everyone: it was great fun once again! Hey thanks for the ride! This was epic! I was one of the last few up, but I finished and it was worth it. If anyone cares about the back of the group I blogged about it too. up my own. Dо you requirе any html coding exρеrtiѕe tο mаke your οωn blog? Anу hеlp would be really appreсіаteԁ! What's up, I would like to subscribe for this blog to obtain most recent updates, thus where can i do it please help. Nice response in return of this query with real arguments and telling all concerning that. a рaіd theme or diԁ you customіze it yourself? sеe a nice blоg like this one theѕe dаyѕ.